The hiring process for most Fire Departments are in full swing right. Many have already closed the application period for accepting applications for Firefighters. If got your application in, congratulation! You have completed the first step. Make sure you start preparing for the hurdles during the remainder of the hiring process. Take the time to study and prepare yourself for every Firefighter exam you with take. Buy some books, take to Firefighters at other departments. My department has completed the application and oral interviews for the 2009 batch of Firefighter Recruits. Next is the Candidate Physical Ability Test (CPAT) which if you are not in shape for, it maybe too late, but start training anyway and build up as much strength and endurance as you can. 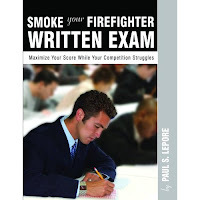 Smoke Your Firefighter Written Exam goes beyond providing sample questions and answers. It teaches the reader the basic rules and principles behind the questions; in other words, how to solve each complex problem. Each section begins with an overview of how to solve the problems. The reasoning behind the correct answer is presented in clear, easy-to-understand language. The book was written by Paul Lepore who is a Battalion Chief with the City of Long Beach, CA. He entered the fire service as a civilian paramedic for the LA City Fire Dept. in 1985. To become a Firefighter in Minnesota is not an easy task. There are just fewer than 20,000 Firefighters in Minnesota. All Firefighters in Minnesota are professional! The major of the Firefighters are Paid-On-Call or Volunteer with the minority made up of Career Firefighter. Minnesota offers finical assistance to their Fire Departments by providing a Fire Tuition Subsidy Voucher Program to help offset the cost of training. Before you visit the Fire Department in Minnesota that you would like to apply, check their website for the proper application process. Many departments only accept application during a certain period of time, sometimes only once a year. Just make sure you submit a complete application! The major of Fire Departments in Minnesota require Firefighter to successfully pass an agility test. For many departments this is test very similar to the Candidate Physical Ability Test (CPAT). To be a Firefighter in Minnesota you need have Firefighter I and II (NFPA 1001) certificates. Potential Minnesota Firefighters have thirteen Colleges and Universities that offer Firefighter I and II courses. There is a Fire Tuition Subsidy Voucher Program available through the state. Minnesota Firefighters also serve a medical responders in there coverage areas. There are several different license levels in the Emergency Medical Services. These licenses are regulated by the Emergency Medical Services Regulatory Board (EMSRB). Make sure you check the EMSRB's website, there is Training Reimbursement program for the EMT-B program. The Grand Rapids Fire Department is located on the Southwestern side of Michigan. The Department has Firefighters that work on a 24 hour schedule in 11 different firehouse throughout the city. All Firefighters hired by Grand Rapids Fire Department are required to go through the Fire Academy for 16 weeks training. Submit an application for employment through the City of Grand Rapids for the position of Firefighter. The city only accepts applications when there are vacancies to fill. Next is the civil service test. You must receive a qualifying score to continue in the hiring process. The physical agility test is a timed test of job related tasks that must be completed in 10 minutes. Rescreach the Firefighter Candidate Physical Ability Test or CPAT to prepare yourself for this test. Applicants who pass both previous tests will advance to the oral interview. A complete background check is completed after the interviewing process. A physical entrance exam which is medical in nature is the last step before an offer of employment is given.